Hours after announcement, Zarif slams US 'spin' of saying sanctions to be phased out and not dropped at once. Mere hours after the US triumphantly announced a framework deal with Iran over its nuclear program and subsequently released a fact sheet, the Islamic regime charged that America was lying about details of the agreement. Iranian Foreign Minister Javad Zarif, who has led negotiations for the Iranians, said all nuclear sanctions would be lifted immediately when the deal is signed, contradicting statements by the American administration, reports the Washington Free Beacon. 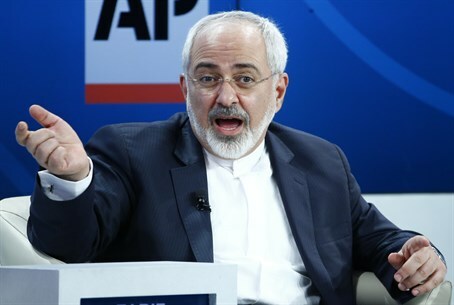 Speaking on Thursday after the agreement, Zarif claimed that upon the signing of a final agreement by the end of June, "all US nuclear related secondary sanctions will be terminated. This, I think, would be a major step forward." He added that Iran will be allow to sell "enriched uranium" on the international market, "hopefully making some money" from the sales. But after US Secretary of State John Kerry and his State Department said the lifting of sanctions would be phased and in accordance to Iran meeting its agreements, Zarif launched a tirade on Twitter accusing the US of lying. Zarif said the US had promised to remove all sanctions immediately, writing "Iran/5+1 Statement: ‘US will cease the application of ALL nuclear-related secondary economic and financial sanctions.’ Is this gradual?" Suggesting an alteration, he added "Iran/P5+1 Statement: ‘The EU will TERMINATE the implementation of ALL nuclear-related economic and financial sanctions’. How about this?" Responding to the State Department fact sheet, he wrote "the solutions are good for all, as they stand. There is no need to spin using ‘fact sheets’ so early on." Zarif said on Thursday that "none of those measures" to limit Iran's nuclear program "include closing any of our facilities. We will continue enriching; we will continue research and development." Speaking about the Arak heavy water nuclear reactor, he said "our heavy water reactor will be modernized." The statement is somewhat ambiguous, given that the US fact sheet says the Arak reactor core, "which would have enabled the production of significant quantities of weapons-grade plutonium, will be destroyed or removed from the country," and the spent nuclear fuel will be shipped out of Iran for the reactor's lifetime. Zarif also said "we will continue the Fordow facility. We will have centrifuges installed in Fordow, but not enriching." In the US fact sheet is written: "Iran has agreed to not conduct research and development associated with uranium enrichment at Fordow for 15 years." Many have warned that keeping centrifuges at covert nuclear sites like Fordow poses a serious threat, both because Iran may secretly restart enrichment and race to the bomb despite inspections as North Korea did, or else wait for 15 years and then be ready to produce nuclear weapons unimpeded. Iran's accusations of America lying bring back memories of the interim deal signed in November 2013, after which the Islamic regime likewise accused the US of lying about the details. Prime Minister Binyamin Netanyahu slammed the deal Thursday night, saying that the agreement threatens Israel's very existence and gives legitimacy to Iran's nuclear program while restoring its economy and allowing it to continue enriching uranium. He called to tighten sanctions and make Iran buckle under the pressure until it submits to a better deal that would remove its ability to create a nuclear weapon altogether.